This is very weird to me because I think back to what people I know were doing when they were 38 and it all seemed very grown-up compared to how I feel now. Appearances can be deceptive, and that can work both ways! I've spent some of my birthday continuing to work on Fat Girasole. It's nice and I'm on to chart D now, and there are strong diagonal lines to help me keep track of where I am and where I should be. 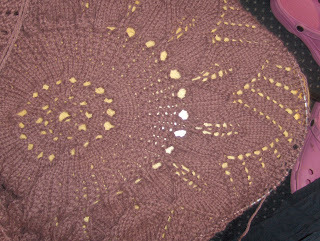 I've finished the leaf motifs and that's quite a satisfying feeling. So here I am answering a meme passed onto me by my pal Dolly Dimple. I've to tell you six quirky but boring things about me. Go to each person's blog and leave a comment that let's them know they've been tagged. 1. I am not shy at all and would happily speak, read, sing etc in front of a large room of people, but I get all awkward when speaking to "official" people. This can be as simple as the gas company or the bank or whatever. 3. I can't stand domestic pets of any kind, but I check out the LOLcats several times a day. Yes really! 5. I am a keen composter and have both the Con 220 and the Komp 250. I recently discovered that although I pronounce "compost" to rhyme with "lost", my friends over the ocean pronounce it to rhyme with "post". *My favourite bus is the 255 but even with medical advances I don't think I'll live that long. Fat Girasole looks cool! You bringing it on Tues, or is it all crochet? Happy Birthday Kathleen - Have a wonderful day ! Happy b-day, honey! Looks like you spent it perfectly (knitting!)! I see I have an imposter ! Hah !